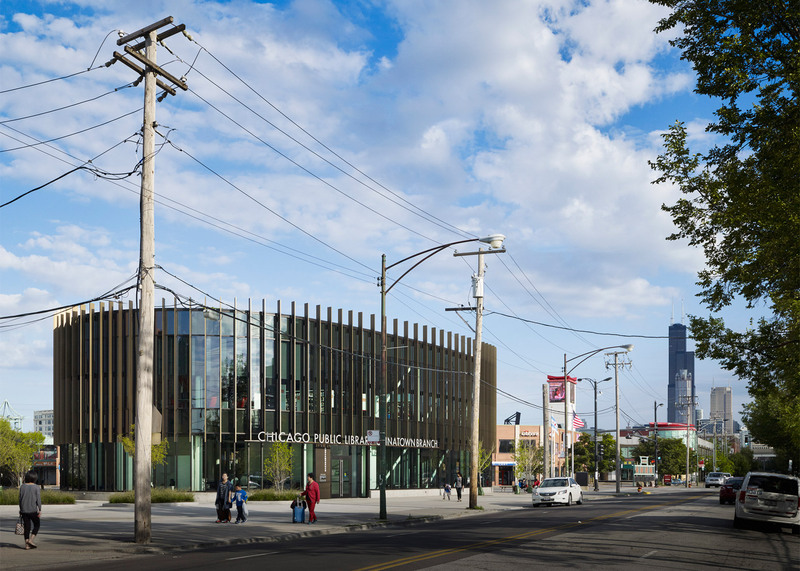 Architecture firm SOM incorporated principles from Feng Shui, the ancient Chinese design philosophy, while conceiving the new Chinatown Branch Library in Chicago (+ slideshow). 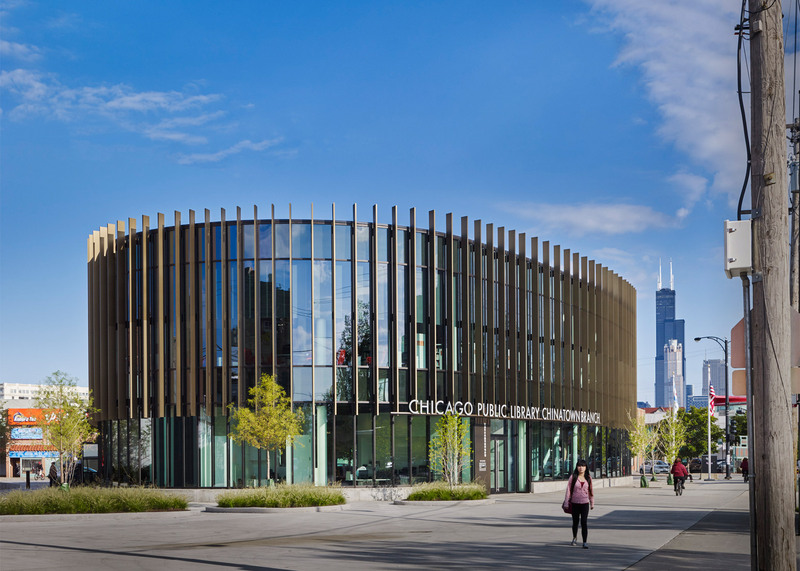 Encompassing 16,000 square feet (1,490 square metres), the new library is located in Chicago's Near South Side, on an urban site near a busy intersection and elevated metro station. 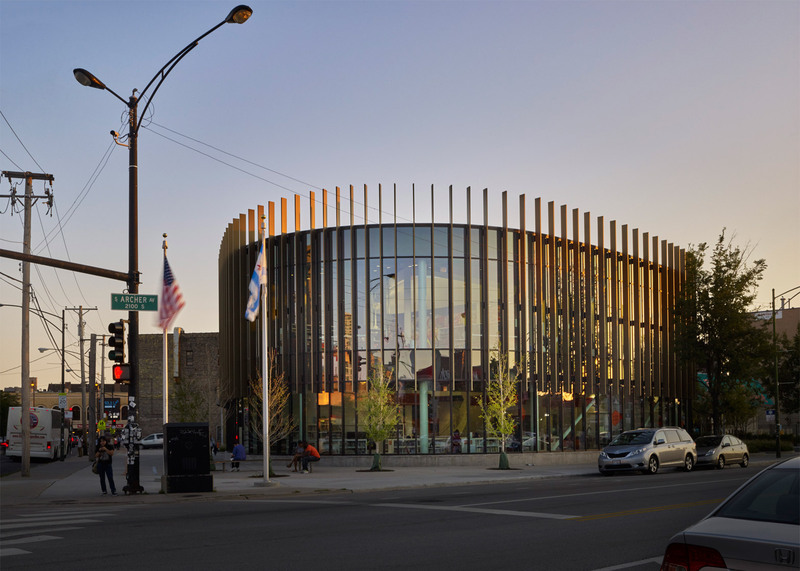 "The building sits at the key intersection of South Archer Avenue and South Wentworth Avenue – the nexus of Chicago's historic southern and emerging northern Chinatown neighbourhoods," the firm said. The two-storey building's rounded triangular form was inspired by the layout of neighbouring roads and Feng Shui, an ancient Chinese philosophical system that is focused on spatial arrangements and the flow of energy. "The soft curves of the pebble-shaped, three-sided structure respond to ancient Feng Shui principles by matching the avenues' existing alignment without creating sharp, aggressive corners," the firm said. "This form allows a fluid movement of pedestrians, abundant landscaping throughout the site, and opens up view corridors so that the building can be seen on all sides," added the architects. The building has a double-layer glass curtain-wall that is wrapped with 118 vertical fins of varying heights. The louvres – made of anodised aluminium with a light bronze finish – reduce heat gain and glare while maintaining views of the neighbourhood for visitors inside the library. The roof, which is visible from a nearby metro station, is covered with native grasses. 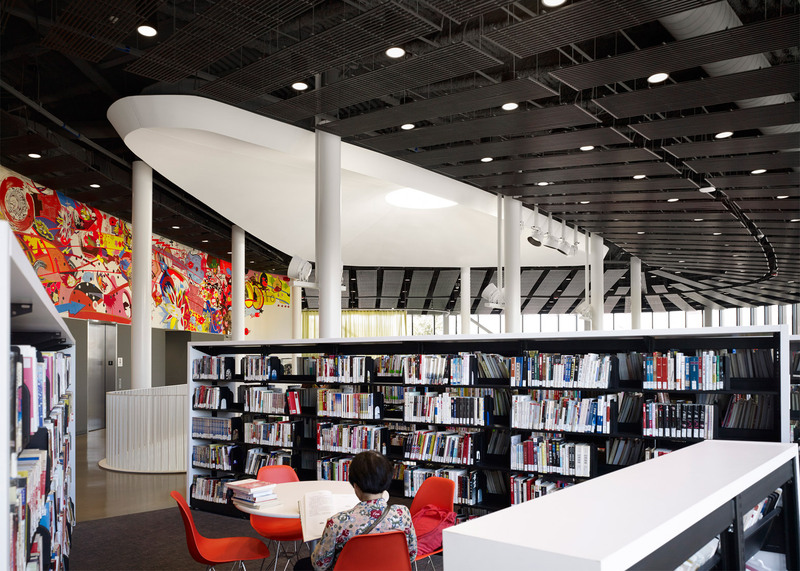 Inside, the programme areas are oriented around a central, double-height atrium. "Like a traditional Chinese courtyard plan, all spaces connect to the central atrium room, providing clear orientation and spatial cohesion," the firm said. 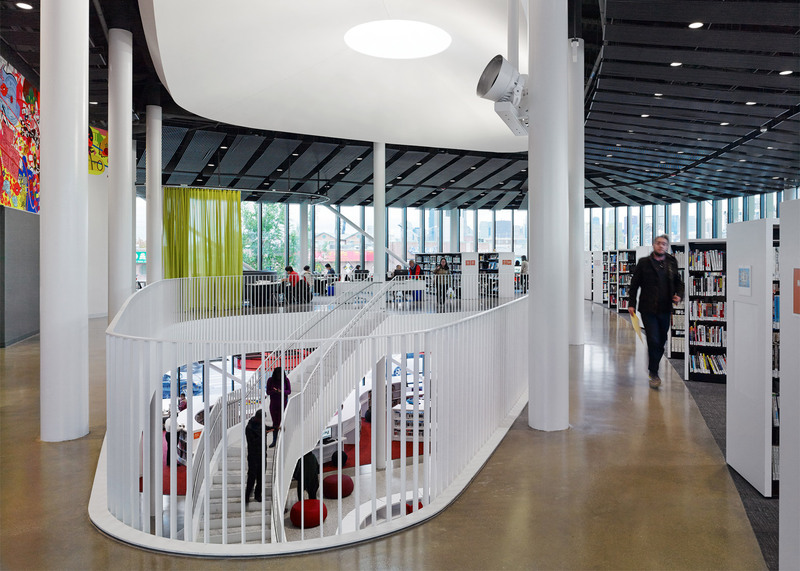 "Throughout the library, a spatially interconnected sequence allows for a sense of discovery and exploration." The interior layout is also intended to provide a high level of flexibility. An open plan, with very few enclosed spaces, enables multiple uses and various configurations of furnishings. "Highly efficient, it is designed for both present and future flexibility," said the firm. 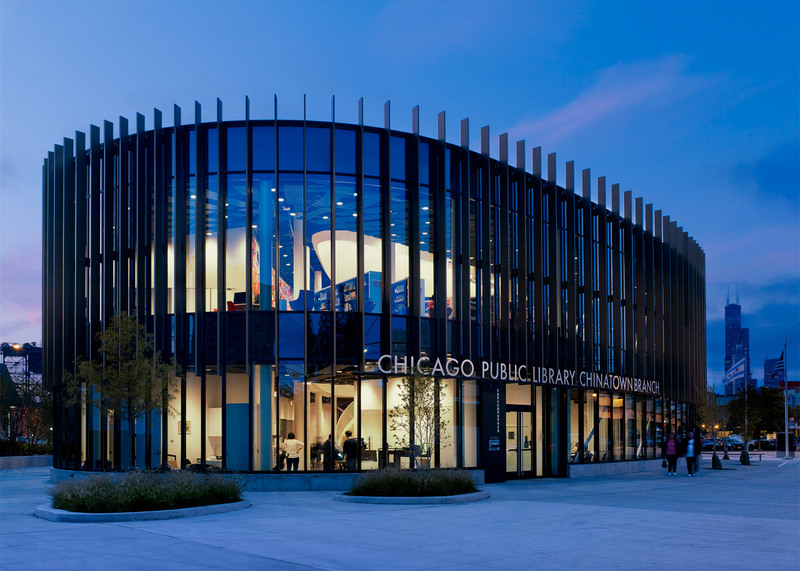 "The design team worked closely with Chicago Public Library officials to identify opportunities for programmatic overlap, thereby increasing the long-term utility." 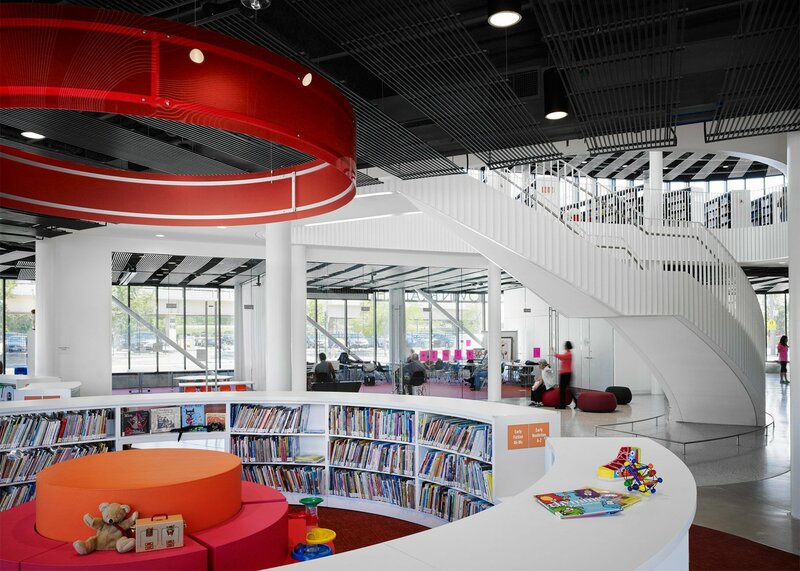 The ground level contains a children's zone, exhibition space, central circulation hall and a community meeting area. The community room is equipped for lectures, tutoring, reading and special events. Acoustic buffering curtains allow the space to be partitioned into smaller rooms, and a pantry enables the library to offer tea service. A grand staircase leads to the second level, which houses reading rooms for teenagers and adults. 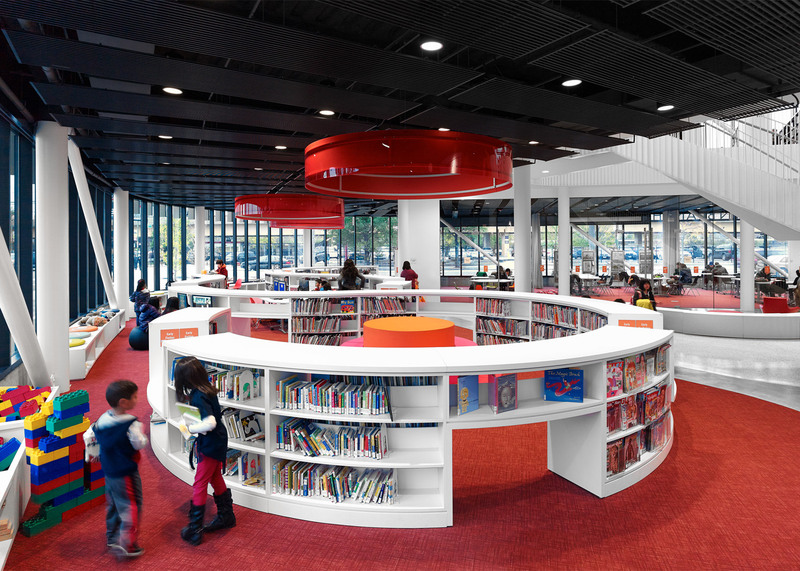 "Eye-height bookshelves in these areas create a sense of openness while still allowing for the creation of informal collaborative areas and intimate reading spots," the firm said. 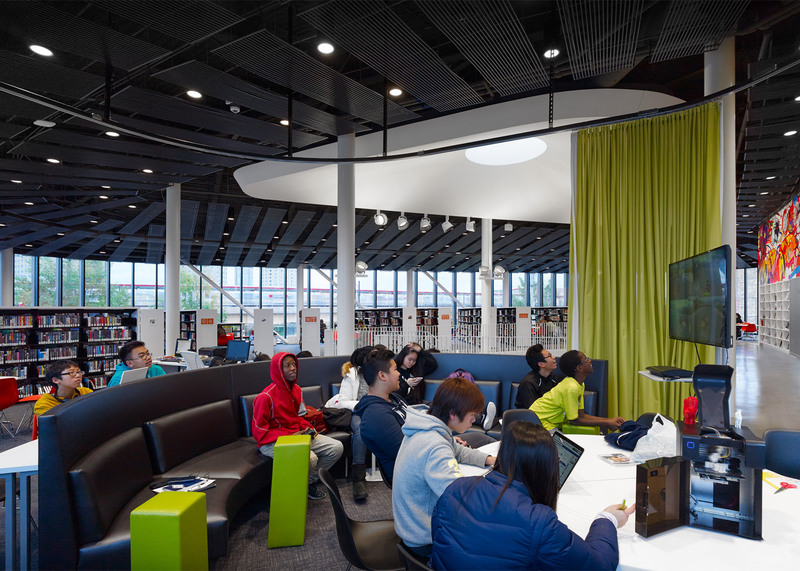 The teen area, called the YOUmedia zone, is defined by a brightly coloured acoustic curtain. The space features a multimedia storytelling area and gaming tables. A prominent feature on the second storey is a mural by local artist CJ Hungerman, which was created as part of Chicago's public art program. Titled Universal Transverse Immigration Proclamation, the mural measures eight feet high by 60 feet wide (2.4 by 18 metres). 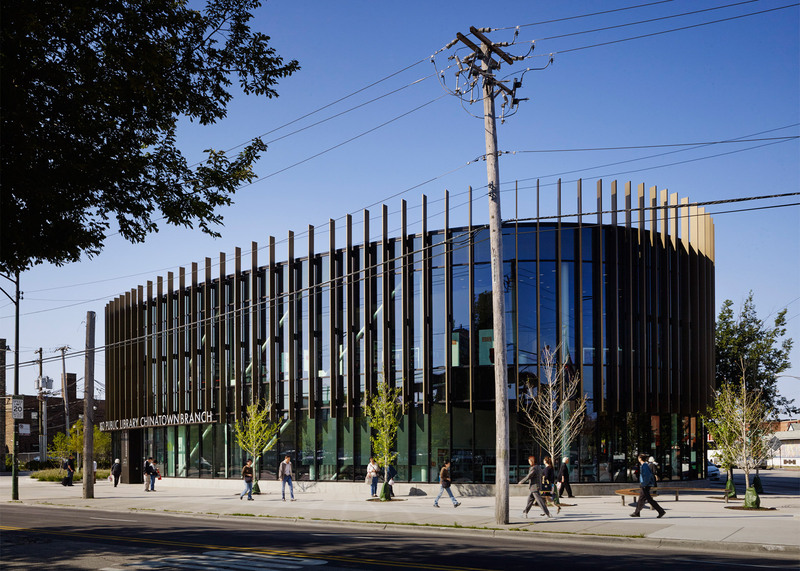 Sustainability played a key role in the building's design, and the project is on track to achieve LEED Gold certification – one of the highest awards for energy-efficient buildings in the US. 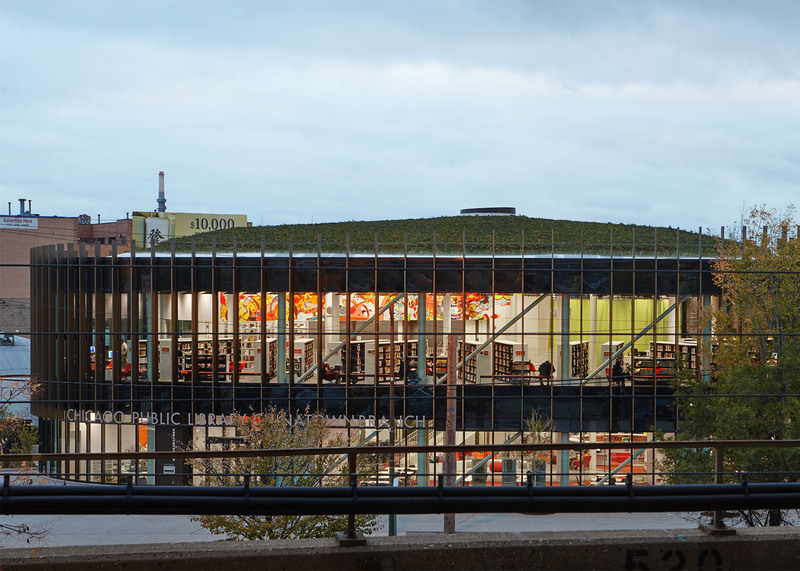 Eco-friendly features include low-energy LEDs placed throughout the facility, ample natural light, a radiant cooling and heating system, and permeable paving that reduces stormwater runoff. 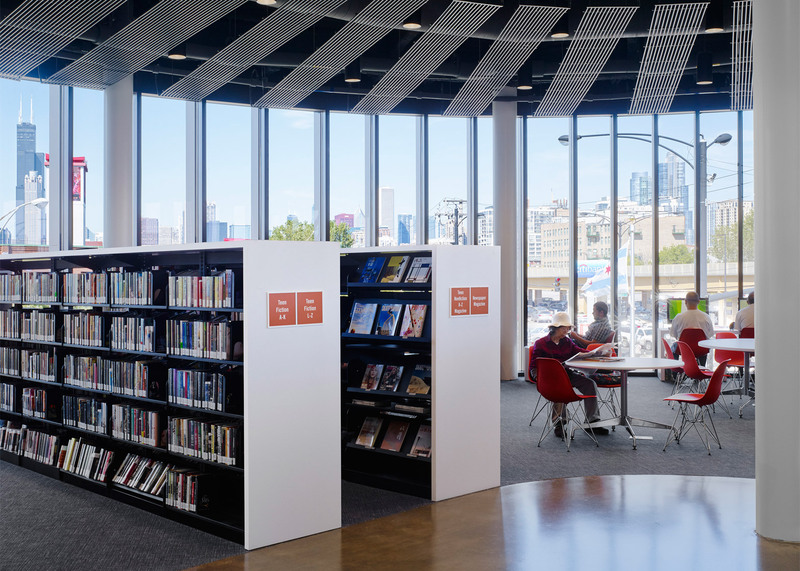 The facility replaces a former library that was one of the most visited in the city's public library system. 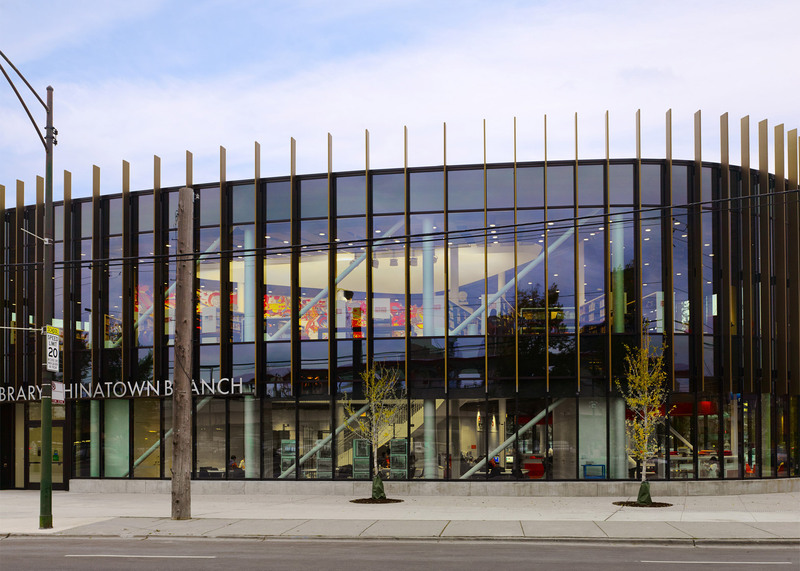 "The Chinatown Branch recognises the critical role that the library plays in uniting the Chinatown community," said Brian Lee, a design partner at SOM. "It creates a key community anchor and an enduring cultural asset that will serve community members of all ages and accommodate diverse activities." 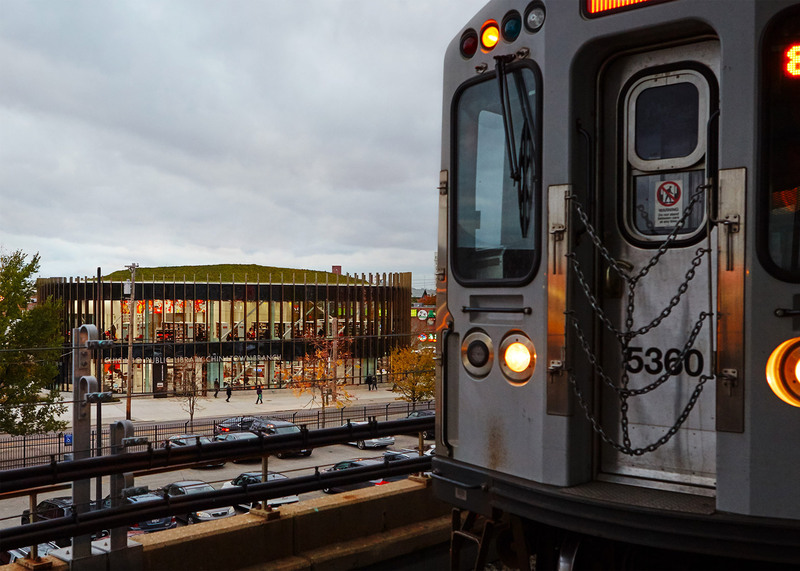 When it comes to ambitious new architecture, Chicago has fallen behind American cities like New York and Los Angeles in the past few decades. But some believe the city is seeing a "new burst of energy." Proposed projects in the Windy City include a super-tall skyscraper by Jeanne Gang and a pair of residential towers by Rafael Viñoly. 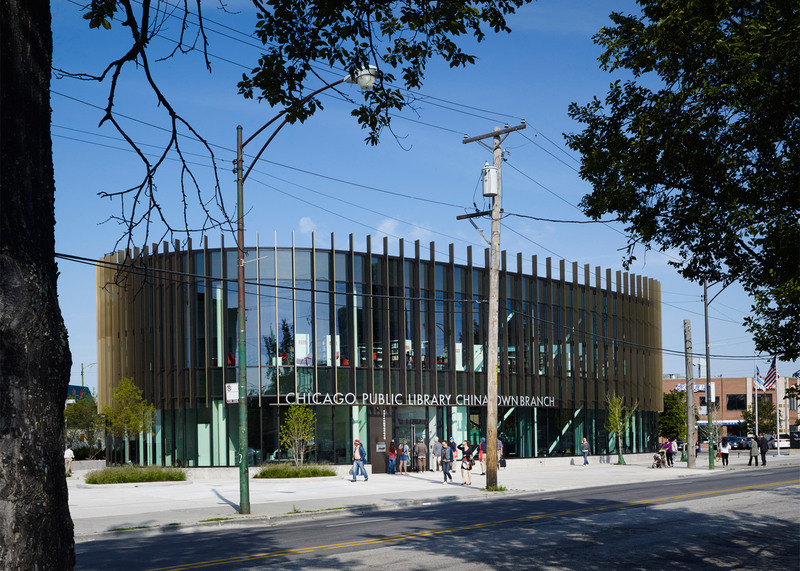 Chicago also recently hosted the first US architecture biennial, which opened in October and closes 3 January 2016. Photography is by Jon Miller at Hedrich Blessing.